Now I need to own up here and say that I’m not a ‘knife kind of guy’. I’ll even go as far a cutting blocks of cheese or salami with my titanium spoon just to avoid carrying a knife. However that was before I’d seen the Deejo knives. 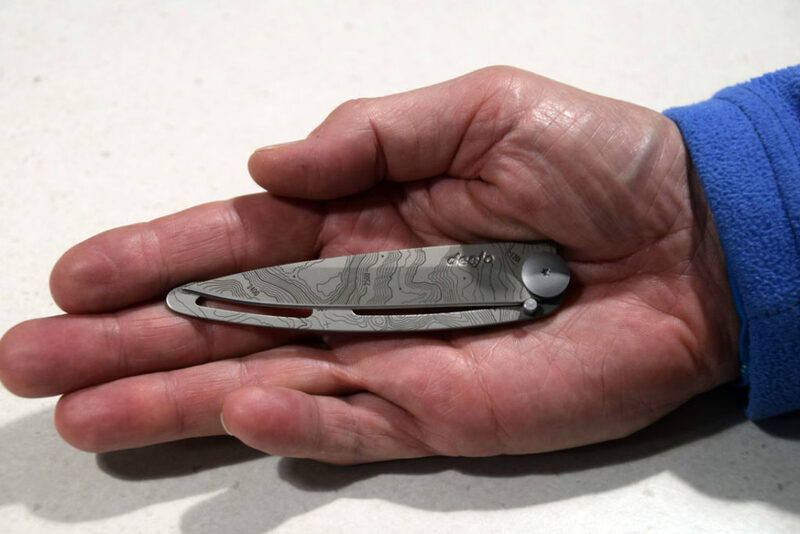 I discovered these knives at the recent Outdoor Retailer Association show in Sydney and having the opportunity to handle them was enough for me to decide that I really wanted one. The first thing that you will notice about these knives even before you pick them up is that they are a work of art. In fact they are almost to pretty to use. The blades come is plain stainless steel as well as a dark grey steel version. What these knives are best known for is their ‘tattoo’ blades. 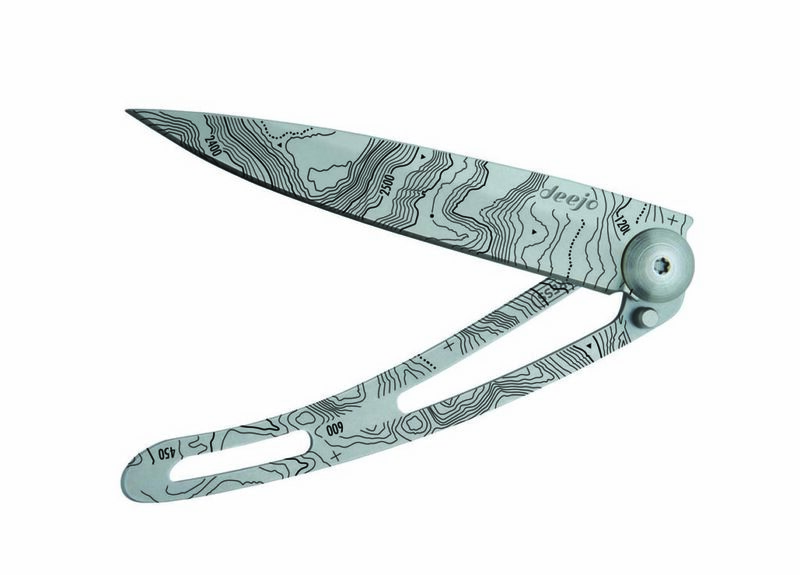 These blades have various motifs etched into the blades ranging from the model shown here which has a topographic map design, to plants, snakes, and many other designs. In fact these knives are so pretty you almost want to mount them on a wall in a display cabinet rather than getting them dirty. 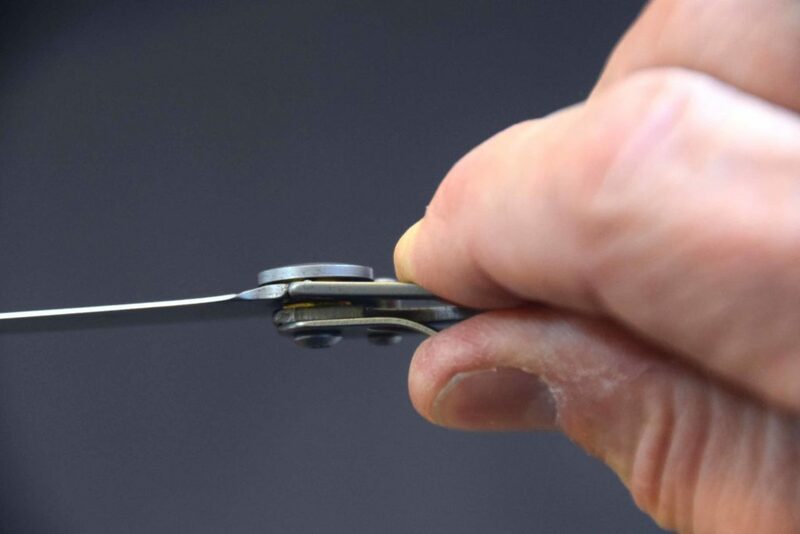 The knives do come in varying lengths but by far the most common size is the 11cm length (Blade folded) which will suit even the largest male hand but without being unwieldy if you hands are a bit smaller. The knife shown in this review is the 11cm ‘Tattoo Naked Topography Knife’ and for someone with fairly large meaty hands I found that this sized knife fit me quite comfortably. I’ve had reason to use knives for work in the past and find that smaller knives are just too awkward. Some of the blades (Deejo One Hand Knifes) also have serration on them which is the way to go if you will be cutting rope on a regular basis. 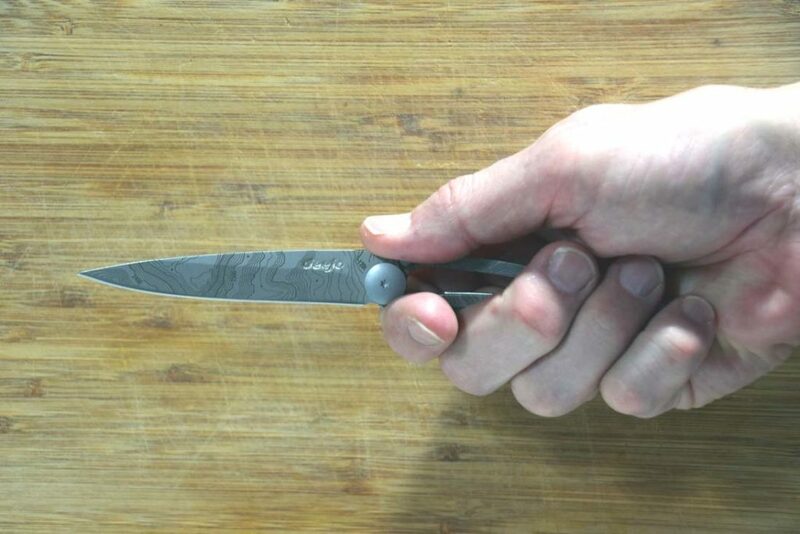 The Deejo knives have a few handles options and the one shown in this review is classed as ‘naked’, which means that the handle is straight metal with no additional grip material. For those looking at a lightweight knife that isn’t being used all day then this is a good option. If you feel that you want a different look or prefer some additional padding then you can get a variety of timbers and even carbon fibre on some of the models. The weight of this knife is advertised as 37grams and both of my two digital scales agreed with this. The knife does come with a small 1gram material pouch if you want to keep it protected or alternatively to can use the attached belt clip. I’m generally not fan of belt loops preferring to keep any knife that I carry inside an easy to get to pocket in my pack. These knives are made in France using 420 stainless steel which means that they are highly corrosion resistant so getting them wet or exposed to chemicals occasionally won’t destroy them. Now as I mentioned at the start of this review I usually don’t carry a knife preferring to make do with my spoon. Given that I’m just about to do a 5-6 week hike I decided that using a spoon for a cutting implement for this long was going to drive me insane and that it was time to break my knife carrying drought. The Deejo knives made this decision so much easier and the Deejo Tattoo Naked Topography Knife shown in this review will be accompanying me on my upcoming trip.